Saudi Arabia is perhaps the only remaining country in the world that takes its name from a ruling family — the Al Saud. It has vast hydrocarbon resources that feed the world’s insatiable hunger for energy. It also is an absolute monarchy founded upon religious principles of Wahhabi Islam. The alliance of the Al Saud with a Wahhabi religious elite largely precludes freedom of thought and individualism. Saudi Arabia is a kingdom where gender segregation permeates every aspect of social life with women looked upon as de facto sexual bombs who, if not contained by male relatives, could explode and send society into disarray. Saudi Arabia also is unique in its reaction to regional revolts known as the Arab Spring, doling out billions of its petrodollars to preclude its citizenry from any thought of taking to the streets. But, according to Karen Elliott House, things in this shrouded kingdom could well change. Ms. House sat down with Reza Akhlaghi to talk about her new book On Saudi Arabia: Its People, Past, Religion, Fault Lines – and Future. 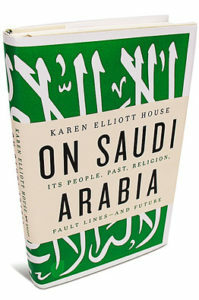 Karen Elliott House is a Pulitzer Prize–winning reporter who spent thirty years writing about Saudi Arabia as diplomatic correspondent and foreign editor at The Wall Street Journal. Later she served as President of Dow Jones International and then publisher of The Wall Street Journal. A former board member of the Council on Foreign Relations, Ms. House is Vice Chair of the RAND Corporation. For over three decades you reported on Saudi Arabia as The Wall Street Journal’s diplomatic correspondent. What made you decide to write this book? What fascinates you most about Saudi Arabia? As diplomatic correspondent, I had spent much time interviewing Saudi government officials on oil, security and geopolitical events but I wanted to understand the Saudi people, society and culture and then understand what was changing in society and why, and what was not changing and why. What fascinates me is how very different are Saudi Arabia and the U.S. Yet there also are similarities between today’s conservative Saudi life and the cloistered life I led in a tiny town in Texas half a century ago growing up in a fundamentalist Christian family with no TV, no alcohol, no musical instruments in my church, and no shorts or pants on the women of the household. It was a life focused on religion and moral living, and that made Saudi Arabia somewhat more familiar to me. You start your book by painting a very gloomy picture of socio-economic as well as religious life in Saudi Arabia. Under the surface of perceived stability in Saudi Arabia, there seems to be a simmering discontent against what appears to be a political order that may have run its course given the tectonic changes in the region and explosion in modern communication technologies. Given its current domestic environment, how is the Saudi power structure coping with an increasingly changing and connected world? The Saudi power structure—the royal and the religious—have come to understand and to make use of modern technology. The religious use the internet to spread the official Wahhabi version of Islam. The royals, who run the government use technology very effectively to seek out terrorists and to spy on their own people. What neither the royals nor the religious fully appreciate is the degree to which the Saudi citizenry, and particularly the youth, are now wired into the wider world of the Internet and thus much better informed and thus much less inclined than their parents to follow the dictates of the power structure. Thus, modern communication is a double-edged sword. The political stability in Saudi Arabia, as you assert in your book, has been assured based on a three-hundred-year old social contract binding the people to their Saudi rulers. This social contract appears to be challenged from multiple fronts. Can you elaborate on some of the key challenges that are contributing to the erosion of this social contract? The original social contract—loyalty for stability—also became loyalty for prosperity after the discovery of oil. But as the population of Saudi Arabia has exploded (there now are 19.6 million Saudis some 60% of whom are under the age of 20) government services have deteriorated. Given satellite television and social media, Saudis know much more about huge wealth disparities and government inefficiencies and this is undermining loyalty to the regime. Additionally, the Al Saud’s legitimacy has always derived from the support it receives from the kingdom’s religious establishment led by the Council of Senior Ulama. But as the religious establishment has become increasingly and visibly subservient to the political needs of the Al Saud, its legitimacy is eroding and with it the legitimacy of the Al Saud. In short, the longstanding partnership between the Al Saud and the religious ulama which benefited both is now providing fewer benefits to either. Your book illustrates the omnipresence of Saudi princes in every aspect of life and their control over all economic levers in the country, so much so that “Saudis of all sorts resent having to beg princes for favors to secure services that should be a public right”. What are some of the key required mechanisms that can lead to the deconstruction of this notion of “privilege” (favor) and possibly lead to a discourse around the notion of “right”? So long as princes seek to retain influence and power, those in government and their many thousands of cousins outside government prefer dispensing privileges to people to receive persona credit rather than creating an efficient government that provides these benefits—good health care, good education, justice—because they are owed to citizens. To change this, would require the royal family, beginning with the King, to emphasize accountability and transparency of government so that officials who didn’t deliver services were held accountable, removed and replaced. Now, when government fails, a new bureaucracy is simply created or some new entity funded by a prince steps in to provide partial services on an ad hoc basis. Even when people benefit from some service or favor bestowed by a prince, many say they resent what they regard as begging for services that should be theirs by right as a citizen. Let’s turn our attention to women. In Wahhabi Islamic thought women are objects, potentially dangerous that need to be controlled. Therefore, the chief concern in Wahhabi thinking is women’s presence in social life. With the reforms being adopted under the rule of the current King Abdullah, how could the increasing participation of Saudi women in social life, however at glacial pace, impact the alliance between the Saudi Royals and the Wahhabi religious establishment? King Abdullah has instituted some gradual reforms—allowing women to have an identity card separate from their male family members, to check into a hotel without a male family member, and encouraging creation of more jobs for women. So far he has kept the reforms modest so that his religious establishment (he appoints the senior Ulama) has continued to support the Al Saud. Given the importance of retaining this ‘Good Housekeeping Seal of Approval’ from the religious establishment, the Al Saud aren’t likely to move at a pace that breaks the bond of mutual self-interest that holds the royals and Wahhabi religious establishment together. So holding this tandem power structure together is the overriding aim of the Al Saud, but the links are fraying as both religious conservatives and more liberal modernizers among the citizenry pull in opposite directions. The level of corruption in Saudi Arabia and the increasing gap between the poor and the rich are in parallel with a growing gap between Islamic teachings and the exercise of those teachings and values by the ruling royals. What, in your opinion, are the implications of these two parallel lines on how Saudis, the youth in particular, view the royal family and the religious elite? Yes, the growing awareness of young Saudis of the gap between the way Wahhabi Islam is preached and practiced is a threat to both the Al Saud and its religious partners. Young Saudis—even very religious ones—are losing respect the religious establishment whom they see as more eager to do the bidding of the Al Saud than of Allah. How youth translate their cynicism about two of the three key pillars of stability in Saudi Arabia (oil wealth being the third) into action for change isn’t clear given that this is a kingdom without any political or even social organizations. Still, thanks to social media, youth definitely are communicating to each other their distaste for the growing gap between the religion of the Prophet Muhammad and the Islam preached but not always practiced in modern Saudi. Given the religious establishment’s grip on the Saudi education system, the near total ban on humanities and philosophy, and the slow pace of educational reforms, are there efforts outside of Saudi Arabia that offer education online on these banned subjects to inquiring Saudi minds with the goal of breaking the status quo on the subject of ‘thought’? Young Saudis can access all kinds of worldwide websites that provide Islamic teaching ranging from modern and moderate to fundamentalist and even jihadist. In whatever form, religious websites are a powerful influence in the kingdom. At the same time, the Saudi King also has sent 100,000 Saudis abroad for non-religious higher education. Some Saudi students, however, also argue that foreign universities should be able to open branches inside the kingdom to allow a far greater number of young Saudis to get a modern education. A growing number of universities including prominent ones like Princeton and Stanford, however, are providing online classes that anyone around the world can join. These are so new I do not know if many or any young Saudis are participating. Undeniably, the potential surely exists for more young Saudis to access education if they have the curiosity to do so. But the Saudi religious establishment will surely continue to teach that obedience–not curiosity or questioning–is the right course for young Saudis and that religious education is sufficient for Saudis. On the future of Saudi Arabia you outline four options, one of which is civil strife. Should the latter become reality, you anticipate that there could be a call for “the agonizing choice of military intervention to safeguard global oil supplies”. Of the four scenarios, which one do you anticipate to be the most likely to unfold? Of the several scenarios I outline in my book, the least likely, I believe, is that the kingdom can transform itself into a more liberal, even if not fully democratic, society of the sort Saudi modernizers wish for. The most likely, I suspect, is a perpetuation of the status quo in which the Al Saud minimal reforms will not keep pace with public pressures for more individual dignity and social justice. As I write in my book there is little chance for real reform unless or until the crown passes to one of the scores of grandsons of the founder who might have the energy, inclination and longevity to make substantial changes. That jump to a new generation, however, entails its own high risks of dividing the royal family and setting off a divisive power struggle. The regional revolts known as the Arab Spring have pushed the U.S.-Saudi relations into a new and complex phase. The Saudi leadership was seriously jolted after the Obama administration essentially pulled the plug on Mubarak’s regime, an event you call in your book as “a double disaster” for the Saudis. What do you expect to be the key determining factors in U.S.-Saudi relations over the next five years? And should the Saudi leadership decide to make an about-face in its strategic and security calculus, do you believe they would be guaranteed the same level of security from potentially new allies like China, Pakistan, and India? In the region as a whole, the U.S. clearly needs to restrain Iran, protect Israel and ensure global oil supplies for the foreseeable future. Spreading democracy to Saudi Arabia is not an American policy priority. But Saudi stability is. Absent greater commitment by the Al Saud to reforms that offer citizens more individual liberty that stability is threatened. Moreover, U.S. friendship with an absolute monarchy that denies its citizens any real voice in governance, will become more politically costly to U.S. administrations. Questions about a close relationship with Riyadh will become more pressing as the U.S. edges closer to energy independence in coming years through production of shale oil and the logic of security for oil erodes in American minds. Meantime, U.S. support for Israel and for the Saudi royal family makes the U.S. government unpopular with many Saudis. The growing trend in the Arab world to replace dictators with governments that claim to be Islamic will, in the short term at least, further erode U.S. influence and standing in the region. The Saudi regime already has begun to hedge its bets by reaching out to China, Russia, Western Europe and Pakistan. As the Saudi foreign minister likes to say, the U.S. and Saudi used to have a catholic marriage but now it is a Muslim marriage—meaning Saudi has multiple partners, not just the U.S. While Pakistan might be able to provide Saudi with a porous nuclear umbrella to counter Iranian nuclear weapons, it is still the U.S. on whom the Saudis would have to rely for protection against external threats, particularly from Iran. Saudi Arabia’s other “marriage partners” such as China, Russia and Europe do not have the capability or inclination to mount major military operations to protect the Al Saud family. So, for the foreseeable future, the Saudi-U.S. marriage, whatever its growing tensions and resentments, remains a useful one for both partners.